Thanks for your interest in Stephen Kardum Painting. My family has been painting in the Bay Area since 1940. During that time I have gained experience in all types of work. I started painting interiors with my father and later went on to working on multi- colored Victorian homes with my brothers. I moved to Sonoma in 1980 and my business took off by word of mouth. We have painted Mary's Pizza on the Square, Sign of the Bear, the interior of the Red Grape and Carneros Restaurant at the Lodge. We have done work at Viansa Winery, Sebastiani Winery and Glen Ellen Market, to name just a few. 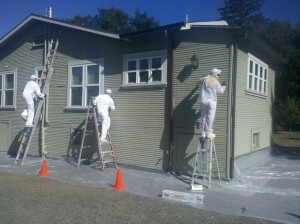 We have done many interior and exterior re-paints all over the valley. We specialize in interior work and can help you with color design when needed. I have found that a good paint job starts with preparation followed by proper primers and finish coats. The materials we use are Benjamin Moore and Kelly Moore products as well as any other products that you may prefer. My crew is very capable of all aspects of the painting business including interior and exterior painting, staining and re-finishing cabinets, interior trim, and decks. We will be happy to address all of your painting needs. We consider no job too small from painting a bathroom to the entire house. We feel that once you try us you will use us again. My crew is always respectful of you and your home. My son Nick has been working with me since finishing college and adds another dimension to what we do. Please give us a call when you are ready. Our estimates are free.